The temple of Apollo at Didyma, in the territory of Miletus, was the site of an ancient oracle that was second in fame only to the Delphic Oracle on the Greek mainland. 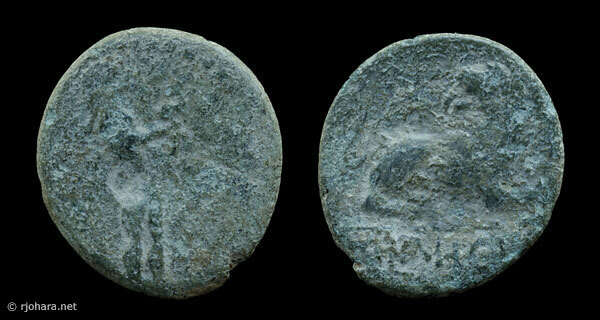 The bronze coins described here feature on the obverse the archaic cult statue of Apollo Didymaios sculpted by Canachus (Kanachos) that was housed in the Didyma temple. They represent numbers 941–1029 in the monographic study of Milesian silver and bronze by Deppert-Lippitz (1984). John Potter’s seventeenth-century history of the oracle of Apollo Didymaios is available here as a sidebar. In a note to the above paper added in proof, Kinns further reported that a “parcel from the 1979 Lechaena hoard ( NC 1985, p. 56, no. 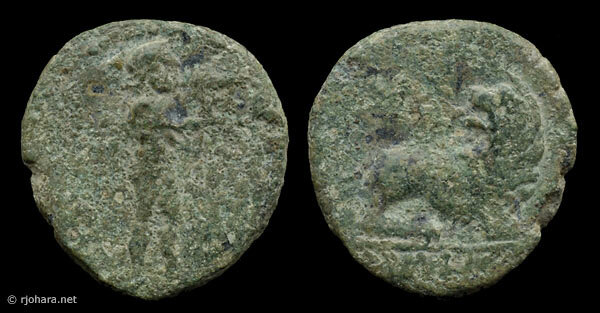 10) which recently appeared on the London market proved to include one Milesian bronze, an example of the statue of Apollo/reclining lion issue with the name ΑΙΣΧΥΛΙΝΟΣ (as D-L 941–56). Since this hoard (or deposit) has a closing date of c. 170 BC and the coin is relatively unworn, here is apparent corroboration of the arguments hesitantly advanced above (pp. 253–5) to show that this type was issued c. 200 BC and not c. 39–17 BC as proposed by D-L” (Kinns, 1986: 260). Kinns has since confirmed this dating through a detailed analysis of the range of magistrates’ names recorded on other silver and bronze types that were issued about 200 BC, and the available epigraphic evidence from the same period (Ashton and Kinns, 2003: 8–13). Thus while “the Apollo of Didyma issues” may be a convenient grouping for general use—as it is, for example, in Sear (1979: #4520–4521)—coins of this overall type were in fact struck during two distinct periods separated by at least a century. This is the “magistrate group” (Deppert-Lippitz, 1984: #941–994). They feature the Milesian ΜΙ monogram to Apollo’s right, as well as one of a number of magistrates’ names in the reverse exergue: ΑΙΣΧΥΛΙΝΟΣ, ΑΥΤΟΚΡΑΤΗΣ, ΒΑΣΙΛΕΙΔΗΣ, ΕΥΔΗΜΟΣ, ΖΩΠΥΡΟΣ, ΜΕΝΕΣΤΡΑΤΟΣ, and ΣΩΣΤΡΑΤΟΣ. Several of the known specimens are visibly overstruck on profile-Apollo/lion bronzes of the late third century, a comparatively scarce and little-studied group (Deppert-Lippitz, 1984: #708–728). No examples of this first Apollo Didymaios series are included in this collection. This is the “ΜΙΛΗϹΙΩΝ group” (Deppert-Lippitz, 1984: #995–1028), featuring the city ethnic ΜΙΛΗϹΙΩΝ (“of the Milesians”) in place of a magistrate’s name in the reverse exergue. The ΜΙ monogram is also absent from the obverse. The two coins included in this collection both belong to this second group. This is the only denomination known for the type. RJO 45. Bronze 17 × 18 mm (5.11 g), about 39–17 BC. Obverse: statue of Apollo Didymaios standing right; trace of dotted border visible in upper left. Reverse: recumbent lion right with head reverted, [ΜΙ]ΛΗ[ϹΙΩΝ] in exergue. Compare Sear (1979: #4521), and Deppert-Lippitz (1984: #995–1028). RJO 48. Bronze 19 × 17 mm (3.87 g), about 39–17 BC. Obverse: statue of Apollo Didymaios standing right; trace of dotted border visible in upper right. Reverse: recumbent lion right with head reverted, ΜΙΛΗϹΙ[ΩΝ] in exergue. Compare Sear (1979: #4521), and Deppert-Lippitz (1984: #995–1028).